Guimard's first significant work, the École du Sacré Coeur, an elementary education facility in the 16th arrondissement, shows the way that he uses technological innovations to improve on a classic building type in French architecture. The building exhibits the usual features of most French primary schools: the bands of yellow brick or stone punctuated by large panels of windows, often topped by shallow arched lintels of red brick, like on the upper level. The key feature of the structure, however, is at ground level, where Guimard has used pairs of inclined iron columns arranged in a V shape (seen here) to raise all the classroom space one floor above. The scheme is directly taken from a design by Eugene-Emmanuel Viollet-le-duc for just such a school, to demonstrate the possibilities of iron structural technology. Here, Guimard has rotated the columns 90 degrees from Viollet's plan to align with the plane of the façades and thus clear the space at ground level under the rest of the structure as a playground, thus solving the problem of the limited space on the site. Much of this area at ground level, however, was enclosed in the 1950s, which eliminated this recreational function. The columns themselves use an unusual shape that leaves them open to precise interpretations, thus attracting continual rumination and attention. They taper towards the bottom, with flared joints where they join the I-beams that support the rest of the school structure above, resembling torches that may represent the archetypal lamp of learning. The twisted grooves on the upper parts of the columns add a kind of dynamism to the shape, as if to represent the compression of force transferred through them to the ground below, much like the sinews of muscles or the plastic three-dimensional forms of stems of plants. It thus represents some of Guimard's first recognizable experiments with Art Nouveau. The Castel Beranger's ornament is full of whiplash and undulating plastic surfaces, such as in the vestibule, whose walls are covered with glazed ceramic tile. These are seamlessly complemented by similar sinuous forms resembling the stems or branches of plants inside the individual apartments, two of which were occupied by Guimard and his friend, the painter Paul Signac. The building makes extensive use of copper sheeting and ornament in the balconies, downspouts, and gates, much of which has been oxidized to a natural green, using strange motifs such as facial masks and seahorses. Its name "Castel" suggests its comparison (especially its picturesque quality and use of rusticated stone) to a medieval castle and, by extension, the Gothic style, which Guimard admired. In 1898 it won the inaugural façade competition launched by the city of Paris to encourage new variety in design amongst the city's monotonous stretches of bourgeois apartment buildings. This distinction, now carved into the façade, catapulted Guimard to instant fame. Nonetheless, the building spawned numerous detractors who decried the curious forms of Art Nouveau, nicknaming the building the "Castel Dérangé" (Deranged Castle). It remains one of Guimard's largest surviving works. One of the commissions that Guimard received in the wake of the success of the Castel Beranger was a combination concert hall and parochial school complex in the 16th arrondissement conceived by the Dominican monk known as Père Lavy, intended to be ready in time for the Exposition Universelle in 1900. Here again Guimard did not disappoint. The lavish building was a tour-de-force of Guimard's creative powers, with sinuous arabesques covering the surfaces and structures, creating a continuous sense of movement and animation for the visitor. The heart of the structure was the octagonal concert hall, with a vaulted roof structure of iron and abundant mahogany paneling, accented by colored glass of yellow and orange whose effect in modulating the interior natural light must have been spectacular. The auditorium, focused around a hexagonal stage with room for 100 musicians and 120 choristers, contained a massive organ. It could seat an audience of 1150 people - one of only two venues in Paris to accommodate that many spectators - on chairs designed by Guimard with a twisted, mass-produced iron frame, all painted green with luxurious embroidered cushions monogrammed "HR." 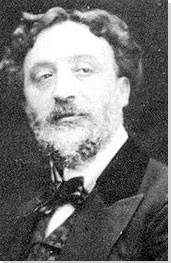 Guimard even consulted noted composer Camille Saint-Saens on the hall's design, producing magnificent acoustic effects. Sadly, the structure was doomed probably from its conception, as Père Lavy was admonished by his superiors for commissioning a building so lavish, whose purpose was viewed as suspect as it appeared to be devoted to secular rather than church functions (the building contained no noticeable religious iconography, nor except for its name did it hint at having a religious purpose). Its construction required a huge amount of expensive materials, including marble, along with the stained glass and ample quantities of mahogany, and was a financial disaster. 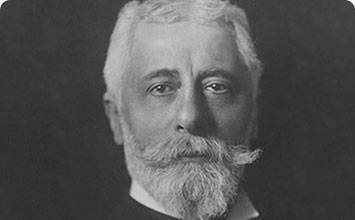 One month after the dedication on 9 November 1901, Père Lavy left Paris, reassigned by his superiors to Constantinople. The building struggled to turn a profit as a concert venue and was sold at auction in 1904; its new owners demolished it soon after and replaced it with a tennis court. When Guimard was commissioned to design what would become his signature work, Paris was only the second city in the world (after London) to have constructed an underground railway. Guimard's design answered the desire to celebrate and promote this new, efficient infrastructure with a bold structure that would be clearly visible on the everyday Paris streetscape. Guimard was awarded the commission as a favor from the Socialist-controlled Paris City Council, whose political leanings mirrored his own sympathies. The Métro connects with themes of Socialism and industry on several levels. Guimard used the industrial materials of cast iron for the structures of the entrances - a nod, no doubt, to the industrial workers who used the system for their commute and helped build the network. Guimard created three standard types of entrances: enclosed, tripod canopies, and open to the sky - that use the twisted, organic vegetal forms typical of Art Nouveau. At first, these appear to be nearly seamless, yet in fact they are constructed out of several cast iron parts that were easily mass-produced at the modern iron foundries to the east of Paris. The possibilities of cast iron were shown off in two unique elaborate enclosed pavilions, located at the busy stations Bastille and Etoile, which were often nicknamed "Chinese pagodas" due to their resemblance to eastern architecture. In another modern twist, the red bulbs that illuminated many of the entrances at night also pulsated upon the arrival of a train to alert potential users at street level. Guimard even invented the typography used for the yellow porcelain signs hung between the lamps, a typeface that has now famously become known as Métropolitain. But the Métro entrances' forms do much more than make smart use of modern technology. Guimard conceived of the Métro as a means to connect people residing in different geographic parts of the city and across social classes and backgrounds - especially since Paris has traditionally been a favorite destination for immigrants and foreign travelers. The sinuous stem, seed-pod, and bulbous forms of nature Guimard employs are unrecognizable as any particular species, in effect making them great levelers of all who use the network, as they are universally incomprehensible - save for the "M" cleverly worked into the seed-pod shields in the railings. Guimard's designs were thus instrumental in bringing Art Nouveau's otherwise complex designs to a mass audience for whom the style seemed like a symbol of unattainable luxury (a function that it arguably still fulfills today). They helped combat the notion that Art Nouveau was a style destined only for a wealthy clientele who could afford lavish and labor-intensive constructions. For all their attempts at unity, the Métro entrances nonetheless represent one of the most noteworthy examples of the French backlash against Art Nouveau. As early as 1908, Guimard's entrances were removed from the Champs-Elysees because they did not "harmonize" with the classical buildings there. Demolition of individual entrances continued through the 1960s, with the Etoile pavilion removed in 1926 and the Bastille station in 1962. With the retrospective recognition of Guimard's artistic genius, however, the remaining 88 entrances have been protected by the French state since 1978. Moreover, the physical dissemination of Guimard's entrances to different cities across the world and their functional installation there means that his designs have become universally synonymous with the idea of mass transit. In this sense, they finally fulfill Guimard's dream of linking people across political, social and economic boundaries, on an even broader level than he may have ever imagined. The Castel Henriette reflects the kinds of suburban or vacation houses that several of Guimard's clients commissioned from him, many of which were either located a short distance from Paris or on the seashore of the English Channel in Normandy. Often the villas were given pet names by their owners, such as "La Bluette," or "La Surprise." Guimard usually designed them with an exposed wood framework of curved members that was filled in with rusticated millstone. Each one used a highly picturesque design, asymmetrical volumes with steep gabled roofs and dormers, and sometimes, tall turrets. The "castel" designation like a castle is appropriate for many of these, as they consisted as private country retreats where their owners could escape the bustle and crowding of Parisian daily life. In another sense, the connection with nature emphasized by Art Nouveau becomes most explicit in these houses, which appear in some cases like modest hamlets that might be carved out of rock formations instead of built, or assembled in a hodgepodge manner from whatever materials are available, not unlike the kinds of houses that Antoni Gaudí, for example, imagined for the residents of the Parc Güell at about the same time. It also gives an illusory sense of age to the structures that makes them appear much like ruined medieval buildings that are being reclaimed by the landscape, a theme that visually was associated with Romanticism. Indeed, when some of these Guimard-designed structures were abandoned their disrepair literally created such kinds of crumbling ruins; in the case of the Castel Henriette, vacated after World War II, the structure was used as a haunted house setting for several films in the 1960s; despite public outcry, it was demolished in April 1969, though several fragments were salvaged and can be located in museum collections. Guimard, like many other architects of his era, including his contemporary Frank Lloyd Wright, had a propensity to make his buildings Gesamtkunstwerks, or total works of art, designing everything down to the tableware and napkins that his clients used. The idea was to make the aesthetic of the entire building as harmonious and seamless as possible. His own house, which he designed in 1909 as a wedding present for his wife, herself a talented painter, was no exception. Numerous examples of Guimard's furniture can be seen today in museums; Mme. Guimard donated the dining room suite from the couple's house in Paris to the city, including the cabinetry and wall panels. As a result, Guimard's furniture, like his buildings, is usually easily recognizable due to his highly personal aesthetic. It was unusual for the exact same furniture designs to be re-used for different commissions. The chairs of this suite are nonetheless characteristic of Guimard's seating designs: they have a tall, thin back that usually terminates in ear-shaped handles at the top, with a kind of sinuous carved construction of the legs that has a very subtle curve to it. In some ways they are reminiscent of 18th-century Rococo furniture, a period which was also seen as a "golden age" of French decorative arts. The cabinetry, meanwhile, is typical of large-scale Art Nouveau storage designs, with a kind of arabesque curve to the front that undulates, bulging forward and recessing back rhythmically, in a manner that keeps the viewer's eye moving about the room, studded with floral and vegetal motifs within the structural members. One can see how the paneling, table and chairs fit nearly seamlessly with the rest of the interior, which was covered with natural relief motifs on the walls and a repetitive, elaborate molding of sinuous brackets around the ceiling line. Guimard's only religious structure is this Jewish house of worship located on the rue Pavee in the Marais, a traditionally Jewish district in the center of Paris; as such, it is often known simply as the Rue Pavee Synagogue. It was commissioned by a community of relatively recent immigrant Orthodox Jews from what is now Russia and Poland. Constructed on a very narrow lot, with little frontage on what is also a very narrow street, Guimard chose to give the structure a distinctive presence by building upward, with a predictably undulating façade capped by a roof that projects forward at the center. The synagogue is one of Guimard's late works; in truth he built no more than five buildings after this structure was inaugurated on 7 June 1914, barely two months before the start of World War I. As such, it forecasts his move towards a stiffer, less flamboyant, and more angular aesthetic characteristic of the larger turn towards Art Deco. This is particularly evident in the main worship space, particularly in the columns and brackets. It is unknown precisely why Guimard chose to depart from his highly personal aesthetic, though cost (the synagogue was erected entirely through private funds) may well have been a factor. The interior worship space, organized on three levels around a central nave, makes the most of a condensed footprint, arguably bringing the congregation closer together as they face one another and the service towards the back of the nave, illuminated itself by a large window. The front of the building, in fact, houses offices and educational spaces, a characteristic of Orthodox Jewish buildings signifying the congregation's wishes to engage more closely with the daily activities of the world beyond rather than cloister itself off. Such a purpose might also be read in the way that the façade is concave, as if to embrace those approaching the building.